Manuscript did publisch the 3 "American Epic" volumes, and the Comics Revue. Most of the art has been shot from the original King Features photostats. This was a project of love and it shows. This edition also has additional Hal Foster artwork including dozens of reproductions of his personal christmas cards. Unfortunally these are expensive books. Besides this they also publish one other comic book: the Companion. Published in 1992. This is also a resource book because a lot of other information about Valiant and Foster can be found as well. The book is re-printed by Fantagraphics in 2009. 1 Volume One: 1937 Manuscript Press Hal Foster English 43 x 56 cm LE 1500. Pages #1 through #46. 1982. 2 Volume Two: 1938 Manuscript Press Hal Foster English 43 x 56 cm LE 1500. Pages #47 through #98. 1984. 3 Voume three: 1939 Manuscript Press Hal Foster English 43 x 56 cm LE of only 1000. Pages #99 through #151. 1986 & 1993. 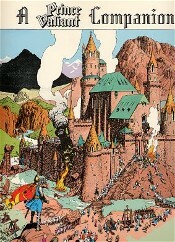 Prince Valiant: An American Epic, Limited Leatherbound Edition Lettered limited hardcover edition of all three books. Originally planned as a limited edition of 26 but only 15 copies manufactured. Owners name inscribed to the cover with golden letters. Original price USD 750 + postages, manufactured to order.